Section 1 - concept of humane experimental technique, types of toxicity and key technologies. Section 2 - 15 chapters on global contributions (scientific societies; national validation centres, key laboratories and regulatory bodies). Section 3 - special areas of interest - chapters on cosmetics, drugs, food safety, inhalation toxicity, carcinogenicity and reproductive toxicology, biologicals, and clinical (human) studies. Data mining and sharing section - chapters on databases and scientific journals. The History of Alternative Test Methods in Toxicology uses a chronological approach to demonstrate how the use of alternative methods has evolved from their conception as adjuncts to traditional animal toxicity tests to replacements for them. This volume in the History of Toxicology and Environmental Health series explores the history of alternative test development, validation, and use, with an emphasis on humanity and good science, in line with the Three Rs (Replacement,Reduction, Refinement) concept expounded by William Russell and Rex Burch in 1959 in their now classic volume, The Principles of Humane Experimental Technique. The book describes the historical development of technologies that have influenced the application of alternatives in toxicology and safety testing. These range from single cell monocultures to sophisticated, miniaturised and microfluidic organism-on-a-chip devices, and also include molecular modelling, chemoinformatics and QSAR analysis, and the use of stem cells, tissue engineering and hollow fibre bioreactors. This has been facilitated by the wider availability of human tissues, advances in tissue culture, analytical and diagnostic methods, increases in computational processing, capabilities, and a greater understanding of cell biology and molecular mechanisms of toxicity. These technological developments have enhanced the range and information content of the toxicity endpoints detected, and therefore the relevance of test systems and data interpretation, while new techniques for non-invasive diagnostic imaging and high resolution detection methods have permitted an increased role for human studies. Several key examples of how these technologies are being harnessed to meet 21st century safety assessment challenges are provided, including their deployment in integrated testing schemes in conjunction with kinetic modelling, and in specialized areas, such as inhalation toxicity studies. The History of Alternative Test Methods in Toxicology uses a chronological approach to demonstrate how the use of alternative methods has evolved from their conception as adjuncts to traditional animal toxicity tests to replacements for them. This volume in the History of Toxicology and Environmental Health series explores the history of alternative test development, validation, and use, with an emphasis on humanity and good science, in line with the Three Rs (Replacement, Reduction, Refinement) concept expounded by William Russell and Rex Burch in 1959 in their now-classic volume, The Principles of Humane Experimental Technique. 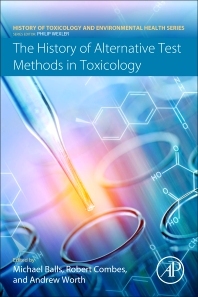 The book describes the historical development of technologies that have influenced the application of alternatives in toxicology and safety testing. These range from single cell monocultures to sophisticated miniaturised and microfluidic organism-on-a-chip devices, and also include molecular modelling, chemoinformatics and QSAR analysis, and the use of stem cells, tissue engineering and hollow fibre bioreactors. This has been facilitated by the wider availability of human tissues, advances in tissue culture, analytical and diagnostic methods, increases in computational processing capabilities, and a greater understanding of cell biology and molecular mechanisms of toxicity. These technological developments have enhanced the range and information content of the toxicity endpoints detected, and therefore the relevance of test systems and data interpretation, while new techniques for non-invasive diagnostic imaging and high resolution detection methods have permitted an increased role for human studies. Several key examples of how these technologies are being harnessed to meet 21st century safety assessment challenges are provided, including their deployment in integrated testing schemes in conjunction with kinetic modelling, and in specialised areas, such as inhalation toxicity studies. Michael Balls graduated in Zoology at Oxford University in 1960, and after post-graduate studies in Geneva, Switzerland, and post-doctoral research in Berkeley, California, and Portland, Oregon, in the USA, returned to Britain in 1966, as a lecturer in the School of Biological Sciences at the University of East Anglia. In 1975, he moved to the University of Nottingham Medical School as a senior lecturer in the Department of Human Morphology, and subsequently became Professor of Medical Cell Biology. In 1995, he was made an Emeritus Professor of the University. Professor Balls became a Trustee of FRAME (Fund for the Replacement of Animals in Medical Experiments) in 1979, was Chairman of the Trustees from 1981 to 2013, and has been Editor-in-Chief of FRAME’s journal, ATLA (Alternatives to Laboratory Animals), since 1983. In 1993, Professor Balls became the first Head of the European Centre for the Validation of Alternative Methods (ECVAM), established as part of the European Commission's Joint Research Centre, located at Ispra, near Lake Maggiore, in Italy. He retired from the Commission in June 2002. After leaving the University of London (Queen Mary College; 1964-1970) with a PhD in Genetics, Robert Combes has held posts in academia, industry, and the charitable sector, including Reader in Toxicology at Portsmouth Polytechnic, Head of Mutagenicity and Cellular Toxicology at Inveresk Research International, Scotland, and Scientific Director, then Director, of FRAME (Fund for the Replacement of Animals in Medical Experiments), based in Nottingham (1994-2008). He has research interests in genetic toxicology, in vitro toxicology, xenobiotic biotransformation, in silico prediction systems and the Three Rs (Reduction, Refinement and Replacement) approach to animal experimentation. Dr Combes has published numerous papers, book chapters and conference proceedings, given presentations at many conferences and workshops, and served on many committees, including the ECVAM Scientific Advisory Committee (ESAC). He was elected a Fellow of the Institute of Biology (now the Royal Biological Society) in 1987, was Secretary of the United Kingdom Environmental Mutagen Society (UKEMS), and was Secretary, then President, of the European Society of Toxicology In Vitro (ESTIV), later to be elected an Honorary Member (2010), and has served on the editorial boards of several journals, including: ATLA Alternatives to Laboratory Animals, Toxicology in Vitro and Mutation Research. Dr Combes has acted as a co-editor for five scientific texts. Andrew Worth is a senior scientific officer at the European Commission’s Joint Research Centre (JRC), where he leads the Predictive Toxicology Group within the Chemical Safety and Alternative Methods Unit. The unit incorporates the EU Reference Laboratory for Alternative to Animal testing (EURL ECVAM), and is part of the JRC’s Directorate for Health, Consumers and Reference Materials. The JRC provides independent scientific and technical support to the European Commission and other policy makers in the EU. Dr Worth has degrees in Physiological Sciences and in Linguistics from Oxford University, and a PhD in Computational Toxicology from Liverpool John Moores University. He has over 180 publications in the area of predictive toxicology, and has a particular interest in the development and assessment of computational methods and their application in the regulatory assessment of chemical safety. During 2012, he held an ORISE fellowship while working at the US Food and Drug Administration's Center for Food Safety and Applied Nutrition (FDA CFSAN). Dr Worth is a member of the editorial boards of ATLA (Alternatives to Laboratory Animals) and Computational Toxicology.